Hope someone can help, Nix? 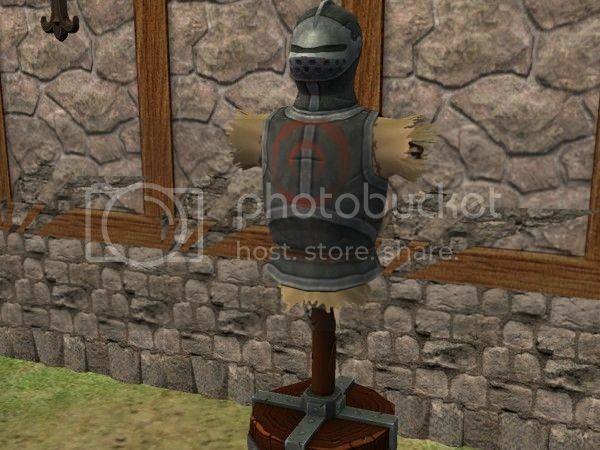 I'm building a medieval knights dorm and used this training dummy https://nixedsims.wordpress.com/2013/12/...ing-dummy/ I'm wondering what recolour do I keep as Clean Installer of course shows them all. I have used the first one, what you get when you place it straight down from the catalog. Hiya Jo - I'm not Nix, and not sure this is right... but, I think that would be the default color. So, if that's the one you want, then you wouldn't need any recolors. I know it's the default colour Cat, but which one is that? What do I chuck out of Clean Installer? I never know! This is why I prefer to build cc free. Or do you mean I just need the file saying it's the mesh? Jo - there's always a default colour inside the package with the mesh. So what you can throw out is ALL the recolours. Thanks Kiri, this is what I was thinking but I wasn't sure, and I would have hated to upload my lot with just a blue mesh there. So if it doesn't need a recolour why is it some lots end up with blue flashing items even when I have installed all the cc? Is that only when it needs a Master? Yup - that's the master/slave thing. Basically it flashes blue when you have a mesh but no recolour. When you're using a slave, you have to have the master because it has the default recolour, and the settings for the recolours. What you could do next time, when you're not sure, is to *move* all recolors to the desktop. If you run the game, and the object doesn't turn blue, then you know for certain that the default recolor is in with the mesh. If there is a Master object in a set, that object will contain parts that some of the other objects in the set may rely on - such as indeed recolors, or at least the *default* recolor. Authors of such sets do not include "MASTER" in the name of their mesh just for fun, but to warn you that you NEED that object for the others to show correctly. They often even specifically *say* so, just to be sure that you do not misunderstand their intention. I like how unambiguous most modders are with such things... EAxis could learn a thing or two from some modders. @joandsarah I see Kiri has already told you what you need to know. As with all objects that aren't repositoried (or "slaved" if you like, but I think "repositoried" sounds better. It means the same thing), the default recolour is included in the mesh, so you can throw away all recolours. And for the record, no, it won't flash blue if you do. Me, I always put "MASTER" and "SLAVE" in the file names of my repository objects, and I also always mention in the post (in bold, red letters) that the set uses the repository technique. It drives me ever so slightly bonkers when creators do neither, and you're somehow supposed to know intuitvely that a set is repositoried and which item is the master. Call me crazy, but I don't think you should have to be able to read minds in order to use set of objects. Thanks guys. That's nice of you Nix, as I know in the past I have decided to toss something only to find yikes I better go find it again!